St. Gallen Symposium Essay Writing Competition 2017 is organised by the university of St. Gallen, Switzerland. St Gallen Symposium Essay Writing Competition is inviting college students (UG & PG) to write a professional, creative and thought-provoking essay on the topic of "Breaking the status quo – what’s YOUR disruptive idea?". The participants should be bold and unconventional while presenting their views on the topic. Candidates should present their alternative guidelines to the concept of growth. The essay should be written in The English Language. Enrolled in a graduate or postgraduate program (master level or higher) in any field of study at a regular university. Born in 1987 or later. Students pursuing bachelor's degree are not eligible to participate. The jury selects the three award winners based on both the quality of the essay and the performance on stage. The award is endowed with a total prize money of CHF 20,000 shared by the 3 winners. 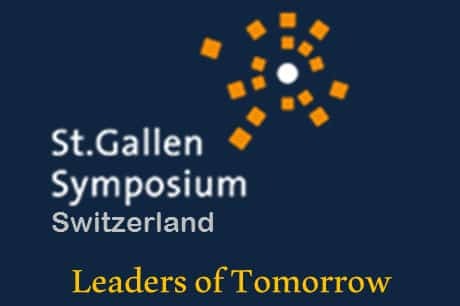 The Top 6 finalists have to travel to Switzerland for the 47th St. Gallen Symposium. Expenses for travel, board and lodging will be covered by the organisers, travel service provided. There would be small and intimate gatherings with world leaders, exclusively for the Leaders of Tomorrow. Become a member of a truly unique and strong global community. The student has to write the essay on the given topic that is What are alternatives to economic growth by giving their thoughts. The essay should not be handwritten. The candidate should not write their anywhere in between the essay. Be bold, creative and ambitious to surprise global leaders with your unique idea - an idea that shall inspire and provoke the minds of hundreds of global current and future leaders! St. Gallen Symposium Essay Submission: After the essay is complete the participants have to upload their essays online. For uploading the essay, the participant has to the first login. Stage 1: Essay Submission: Submission of an Essay on the given topic. The essay will be evaluated according to specific criteria by an independent jury composed of professors, corporate executives and entrepreneurs. They will select the best 100 essays out of all the entries received. These 100 people will qualify as Leaders of Tomorrow and will be invited by the International Students' Committee (ISC) to the next St. Gallen Symposium. Stage 2: Qualify as a semi-finalist- You qualify as a semi-finalist to compete for the prestigious award 2017 if your essay makes it in the top 20. Stage 4: On Stage- In this stage, the 6 finalists will compete against each other for the St. Gallen's Symposium award on the symposium’s big stage.